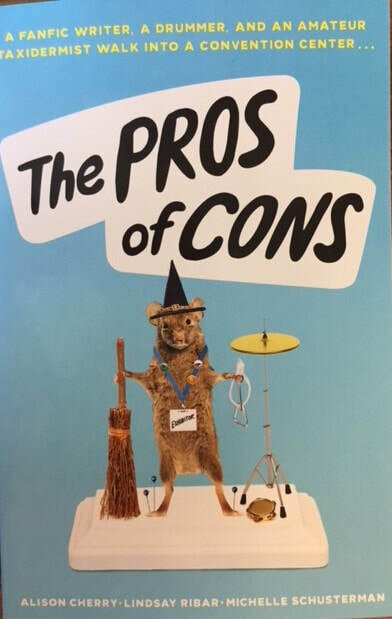 The "Cons" in the title refer to various types of conventions in this book. Vanessa is excited to go to Comic Con, and even more so because she will finally meet Soleil, her online crush of many months, in person. She is looking forward to co-authoring fan fiction, spending time among like-minded Harry Potter fans, and seeing whether a relationship with Soleil will go anywhere. Phoebe is an ambitious percussionist in town for a band convention. When she accidentally switches a percussion case with a taxidermy case after a collision in the lobby, she is forced to play a competition piece with improvised tools instead of regular mallets. To make things more complicated, her former best friend is hanging out with new band girls lately, and her best guy friend has been acting weird. Callie is being dragged along to another taxidermy convention with her father, hoping that if she does everything well enough as his assistant, her dad will finally relax and they can have some time to connect with each other. No matter how hard she tries, she can't seem to do anything well enough. Sabotage may be her best hope. Charming, funny, and relatable relationship stories of three distinct characters intersect over the course of the book. Although it was written by three different authors for each of the three main perspectives, the shifts are seamless. Each character has to face a flaw, but each character also gets meaningful support to follow her own dreams. This book contains some mature references and content. "The Pros of Cons quote."